1.I wish you all a very happy and prosperous new year. Let 2016 be a year of achievement and fulfilment for each one of you. 2.India is a nation with a significant young population. Over six hundred million people in our country are below the age of 25 years. The National Youth Policy defines youth as those persons who are in the age group of 15 to 29 years. I am however not subscribing to any technical definition here. For me, youth is much more than mere age. I place my faith in those who are curious and keen to learn; who are impatient and adventurous; who have boundless energy and drive; who accept the permanence of change and are ever ready to question the status quo; and who have the potential to create and harness disruptive technologies for rapid growth. 3.Investment in educating the youth, in the sharpening of their mental faculties, technical skills, professional competence, and awareness about their social responsibilities, would be the key to prepare them for nation-building. The way we nurture our youth into confident, capable and committed citizens will determine our country’s future. I have therefore chosen to speak to you today on "Youth and Nation-building”, a subject close to my heart. 4.When we talk of nation-building, the first thing we have to think of is what kind of nation we want to build? A blueprint for that cannot be some random sketch but a grand design based on values, hopes and aspirations of the people of the nation. On twenty-sixth January 1950, we laid a strong foundation by giving ourselves the Constitution of India. 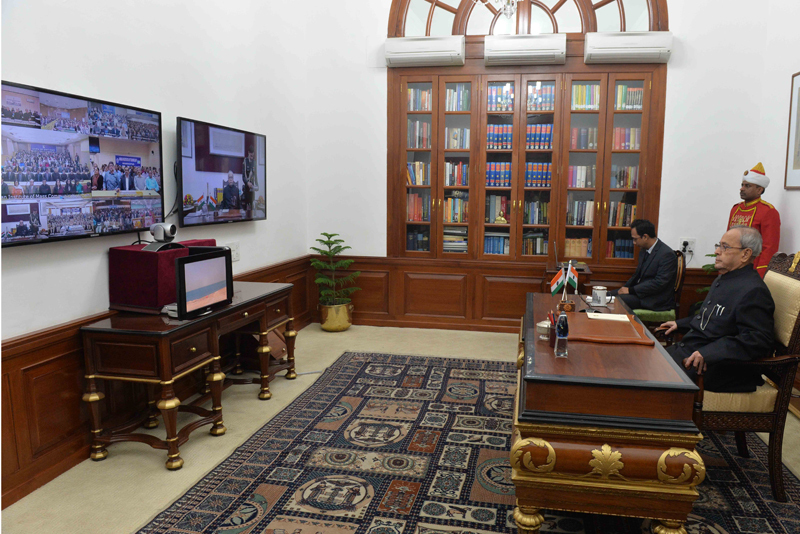 It was themagna carta of socio-economic transformation for building an inclusive and modern India. We promised ourselves to secure to all the citizens of this sovereign nationjustice,liberty,equality andfraternity. The core principles of democracy, secularism, gender equality and socio-economic equity became the beacon for our journey forward. 5.Let me pause here to take a look at the changes that surround us. Information and communication technology has made us think, act and react differently. Distances have shrunk; mobility has increased; instant communication has led to greater awareness, and raised expectations. Consumerism is at its peak. Medical sciences have raised the life expectancy and through better healthcare improved the quality of life. Disruptive technologies have become the rule rather than the exception, putting strain on adaptive capacity of individuals and systems. 6.It is in this environment that the youth have to shoulder the responsibility of nation-building. They must be readied for it through the medium of education and training. The education that we impart to our youth must have three clearly-defined goals. First, it must teach them to control their lives, which can be done through character-building, healthcare, and sharpening the ability to learn and use experience for attainment of one’s goals. Second, it must teach them to understand life through a study of history, science, religion and philosophy. And the third, it must teach them to enjoy their lives through friendships and relationships, observance of nature, and study of art and literature. Our education system must gear up to develop our youth on these lines. 7.We must provide value-based education to our youth. We must inculcate in them the spirit of democratic behaviour which calls for an appreciation of the rich diversity of our nation, assimilation of ideas, and accommodation for divergent or contrarian views. The idea of secularism is deeply ingrained in the consciousness of our nation. It has to be further strengthened in the minds of the young ones to build a harmonious society. 8.Gender equality is essential for building an inclusive society. Unless women participate on equal terms and in equal numbers in the process of nation-building, all efforts will remain incomplete. The occurrence of some unfortunate incidents of atrocity and violence against women in recent years should strengthen our resolve to wipe out any trace of depravity and evil from the minds of individuals. ‘Respect for women’ is sacrosanct in our society with its roots embedded in our civilizational values, which are reflected in our Constitution. A spirit of reverence towards women must be instilled in our children in our homes and educational institutions. It must guide social conduct of an individual from an early age. 9.Without socio-economic equity, the word "inclusion” has no meaning. During the last few years, we have provided citizens the right to information, employment, education and food, backed by legal guarantees. The Government has launched programmes for financial inclusion, creation of model villages and formation of a digitally-empowered society. We have strong legislations and schemes oriented towards inclusion. What we have to do now is to create enough opportunities through their implementation to meet the ambitions of an aspirational India. 10. The nation which you have to build as bureaucrats, technocrats, scientists, educators, social innovators, thinkers, and agriculturists has to be an India which will ensure a decent and fulfilling life to all its citizens. It has to be aswachh India, swasth India, a digitally-empowered India, educated and skilled India, and a tolerant, harmonious and peaceful India where the last person feels a part of the narrative of the country. 11. India needs novel ideas and creative solutions to overcome challenges in the fields of education, skill development, sanitation and healthcare, financial inclusion and service provision. A successful innovative idea is one that has scalability. How can we skill one million of our youth every month? How can we gainfully employ trained manpower in the industry? How can we provide healthcare services to each rural household? How can we meet the financing requirements of small farmers and entrepreneurs in villages and small towns? How can we make public utility services more accessible, inclusive and transparent? 12. The answers to these questions lie in creating a strong digital backbone that can lead to efficient service delivery. Putting a mobile phone in the hands of a person living in a remote village and teaching him to use it to access information, knowledge and services is a great act of empowerment. It gives true meaning to the word ‘inclusion’. 13. For building the India of our dreams, we all have to work together to develop an eco-system which will bring together innovators, entrepreneurs and financiers, which will recognize merit and give primacy to science, technology and innovation. A facilitative and supportive environment for free play of all creative forces, be it in government, corporate sector or academia, has to be created. 14. The government has just launched "Start-up India" to promote start-ups and offer incentives for entrepreneurship and job creation. The over 4,500 start-ups make India the third largest start-up eco-system in the world. The higher academic institutions have a clear role to play in refining the entrepreneurial abilities of their students. Teaching of entrepreneurial studies as a course in our institutes will be a good beginning. i.Assign them to teach in nearby government schools for at least one hour per month. ii.Deploy them to undertake community-based projects to uplift the condition of people in the vicinity. iii.Assign them to identify problems faced by villages and work on innovative solutions which blend modern technology with local practices. 16. Tomorrow belongs to you. Your commitment to national goals will determine the direction of our future growth. As you get ready to embark on the journey to fulfill your dreams, let me share with you my own little checklist for nation-building. - We think more than we talk. You may just find this list useful.